In our last issue of The Reflector, we talked about the severe symptoms of stress and how it can physically manifest itself in your life. Now, meet a group on campus who has found their unique outlet to escape the less-flattering parts of student life. The Nerd Herd. The Gamer Gang. 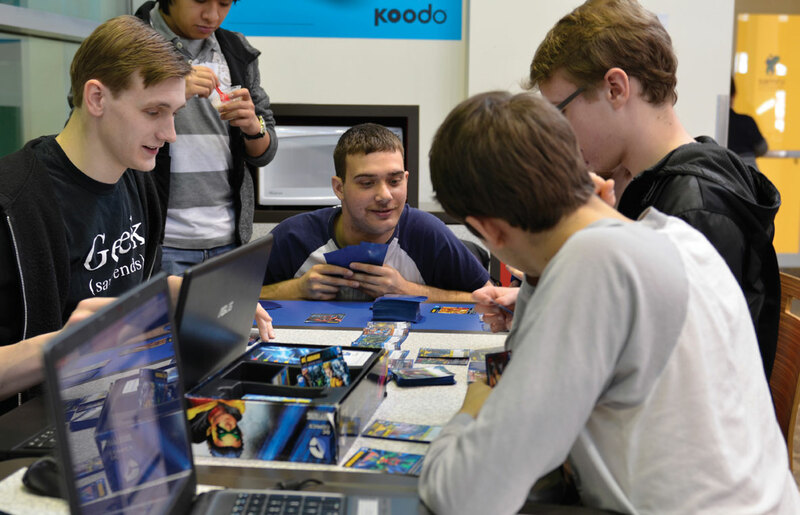 Whatever you may know them as, chances are you’ve seen them upstairs with Magic: The Gathering or their PC games. What you may not know is that they are kind and welcoming people who are just trying to escape the stresses of being an everyday student. “It’s a good way to unwind and get to know people,” said Chris Manuel-Smith. You can find them on the second floor of Wyckham House, as that space has been overrun by the group of students who take the chairs and tables to meet up, and play video and board games together. They are there at least five days a week, with varying numbers of gamers. While they don’t necessarily stick to just one game, they are often seen playing the popular card game, Magic: The Gathering (MTG), or button-mashing during intense video game battles. While gaming isn’t an uncommon trend, it is now being seen as a new type of accepted social gathering, rather than sneered at as it once was. Calgary’s Sentry Box advertises themselves as the largest adventure gaming and science fiction and fantasy book store in Canada, and hosts a number of tournaments and leagues around all types of gaming. Even Broken City, one of the more popular social club and live music venues in the city, hosts a MTG event every Wednesday. Dickens’ Pub has also capitalized on this, devoting every Sunday to “Gamer Sundays”, where they host a number of board and video games free to play. The Nerd Herd isn’t part of Club N3rd, despite popular belief. While a lot of the players are members of the club, they meet up completely independent of that – just for the love of the game. MTG — or any table-top gaming for that matter — might not be everyone’s cup of tea, however the gang upstairs is a pretty welcoming group. So if you’re at all curious about the games, want to give it a try, or just want to meet some new people, grab some dice and head on up. Who knows, maybe you’ll come to love your inner nerd.